The Operating Log Unloading Car No. 3451 has a chassis that is die-cast metal and a tilting tray that is blacked sheet steel. This tray would tilt and unload logs into the line side bin with the use of a No. 6019 or UCS track section. Came with five unstained 7/16" diameter by 4-5/8" long logs. Variation A: The tilt tray is fastened to chassis with three round head screws. There is a nickel sized hole in the chassis with three stake marks protruding into the hole approximately 120 degrees apart. Rubber-stamped "3451 LIONEL LINES 3451" on the sides which is often found faded and indistinct. Came with staple-end Type 3 trucks without stake marks where the coupler attaches. 1946 Production. Variation B: Chassis has been altered by changing the size of the hole to a 1-1/4" diameter with no protruding stake marks. The tilt tray shaft is held in place by clips that swivel and are fastened to the chassis by bosses that were stamped in place that look like rivet heads. Rubber-stamped lettering like Variation A, but with stake marks that attach the couplers. 1947 Production. Variation C: Identical to Variation B except with heat-stamped lettering. Late 1947 - 1948 Production. 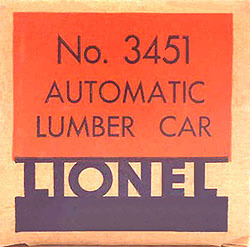 During the years 1947 and 1948 Lionel would begin to house this car in two different boxes. The larger box numbered 3451 included a No. 160 bin and was for separate sale. The other smaller box was numbered 3451X does not include the No. 160 bin. This box was used in sets and the bin was included separately within the set box. See the picture at the top of this page. This box is occasionally found without the "X" suffix rubber stamp.